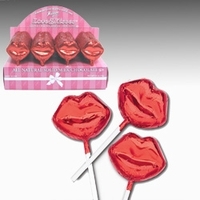 Solid milk chocolate suckers in the shape of lips wrapped in a bright red foil. A perfect Valentine Candy for that someone special you are sweet on. Each sucker is approx. 2 x 7/16 x 4 1/4. Let that someone special know just how kissable you think they are. Send one sucker or a dozen.